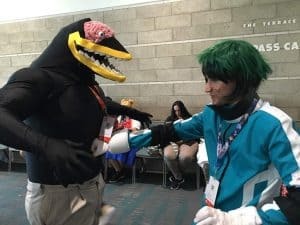 My Hero Academia Cosplay is a popular anime currently running with 3 seasons with 63 + a recap episodes. 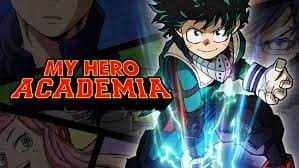 The first season follows the main character Izuku Midoriya born with no quirk. How he meets All Might, attending U.A. High School, and then fighting the League of Villains who are the worlds bad guys! There are currently 3 seasons of My Hero Academia with a 4th planned. Check out some of the awesome costumes I came across on the net. At all the cosplay events it surprises me how good of a job people do! These are some of my favorites. Having a live action battle! Always makes for a good photo as well. Froppy is a popular costume for women and it looks so cool! Some people make their own cosplay costumes and other buy or order them online. Making my own would be out of the question since the amount of time needed is insane. Pintrest has a large amount of My Hero Academia cosplay costumes. 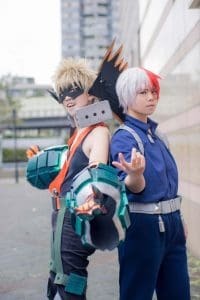 There are thousands of images of My Hero Academia Cosplay with many different groups to follow. Figuring out the next cosplay costume to get might of became a lot easier! Many people ask were is the best place to buy My Hero Academia costumes so I decided to find out! I started by looking around the internet and seeing which ones were the most reliable and trustworthy. Finding out who had the best customer service and allowed returns was important for me since clothes never fit me first time! Milano has a large selection as well with 500+ items and a lot of nice wigs! With only 35+ items for My Hero Academia Miccostumes make it up for it in reviews and quality. They have some great wigs as well. Role Cosplay has some great sales going on for My Hero Academia with just over 50+ items. Cosplay sky has 60+ items for My Hero Academia with the lowest prices! These are my best picks for places to shop for My Hero Academia costumes. After checking about 20 or so different cosplay websites I went with these 5. Each have been chosen for there own reasons for example some have more boots, gloves, etc. Wondering what the My Hero Academia Cosplay costumes look like on someone? Then this video will give some great insight into the different characters outfits you can get!